With Valentine’s Day right around the corner, we want to make sure you are ready with the perfect outfit, no matter what your date night plans are! Whatever your relationship status may be, I’m pretty sure we can all agree that dating is just as confusing and complicated as ever! Whether you are casually dating or in a long-term relationship, knowing what to wear on date night is a challenge we’ve all faced. There’s nothing more awkward than showing up to a date in a dress and heels, and your date is wearing jeans and a tee, but don’t worry, we won’t let that happen! Here’s our advice: don’t get caught up in the unknowns of dating. You are a beautiful, fun, and interesting individual, so put your best foot forward with an outfit that will boost your confidence and make you feel comfortable and beautiful so you can just focus on being your wonderful self and wow your date! 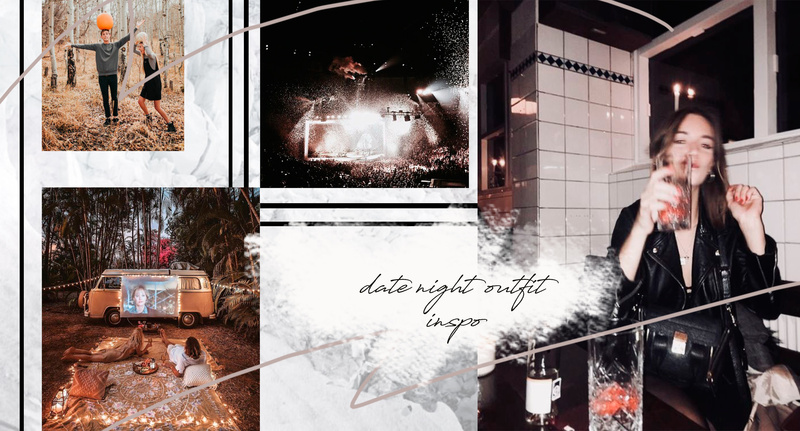 So, let’s take a look at some popular date destinations so you’re ready and stylish for no matter what comes your way! Coffee - On your next coffee date, keep it cute and casual. Throw on your favorite pair of DL1961 skinny jeans and a comfy, stylish Free People sweater. Find an accessory that shows off your style like a cute Brixton hat or some bohemian jewels and pair it with some cute Matisse Footwear boots to tie it all together! You don’t need an extravagant outfit for this date - just keep it simple and focus on being yourself! And most importantly, make sure to order that caramel macchiato with the whip and extra shot of espresso because we all know what’s really the most important part of this date! Dinner - Let’s be real, who doesn’t like to be wined and dined every now and then? Regardless of the restaurant’s atmosphere, a dinner date is always a good excuse to dress up like you’re going to the fanciest place in town. Show off your classy and feminine side by choosing a sleek and stylish For Love and Lemons dress, chunky heels or strappy sandals, and a simple clutch. With an outfit like that on, your date won’t need a menu to know what he wants. If you know what restaurant you are going to and it’s more casual, trade out the heels for some cute Matisse boots and maybe throw on a cute ASTR the Label jacket with your dress to make the whole look a little less formal! Either way, make sure to order at least two glasses of wine, you’ll thank us later! Concert - How you dress for your next concert all depends on the genre of music! But whether you’re going to Taylor Swift, Kanye, or a music festival, there are a few necessities for your concert date outfit. You’ll need to be able to dance (because concerts are basically the perfect place to show off your supa cool dance skills, right?) and be prepared for the elements, especially if the concert is outdoors. For some concerts you may want to dress it up a little, but for most you can just keep it fun, casual, and trendy. Whether it’s country or rock, you can’t go wrong with a pair of chic denim shorts, a cute For Love and Lemons crop top, and your fave Brixton hat! Hiking - So you and your boo are feeling up to a challenge? Okay girl, you do you, personally I was feeling the dinner date… Going on a hike is a fun, casual way to hang out while getting that cardio in! For this outdoorsy date hold back on your inner boho chic goddess and make sure you bring layers and consider functionality. Keep it cute and stylish with Joah Brown leggings, a chic cropped tank, and your favorite pair of cute and functional sneaks. He’ll be loving the view (oh, and I guess the mountain scenery will look good too). Exploring the city - Whether you’re pretending to be tourist in your own city or actually exploring a new one, traipsing around downtown is always a good idea. You and your date will find plenty to talk about as you wander through the streets finding cute new coffee shops, trendy boutique clothing stores, or just admiring the city views. For this adventurous date, we suggest keeping it fun! From a flattering boho chic dress or trendy romper to a sassy cropped vintage graphic tee and some killer jeans, find an outfit that makes you feel confident and stand out from the city backdrop. Pair your look with some chunky (but V comfy) heels, statement boho earrings, and your boo thang. Most importantly, don’t forget that the most important part of the date is your relationship! Be comfortable, be yourself, and have fun! Let’s be real, we know you will look absolutely fabulous no matter what you wear! This entry was posted in BitterSweet, Blog, Fashion, Inspiration, Lifestyle and tagged boho style, date night outfit, date style, fashion.